At the core of my work is an exploration of the tension between opposite concepts, like the symmetry of geometric patterns and the asymmetry of organic designs, transparency and solidity, reality and imagination. The tension between symmetry and asymmetry is perceptible in the superimposition of ornamental patterns on top of biological structures like tree trunks. 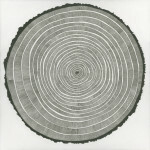 It also shows in the representation of natural patterns like the rings of a tree with geometric repetitive shapes. In my still life paintings, the delicate organic shapes of the flora are strongly contrasting with very bold decorative patterns. This elaborate patterning gives some of my paintings a look reminiscent of fabric or paper collage, although all the designs are actually hand painted. I love experimenting with different media (acrylic, watercolor, ink, graphite…) following the pull of my curiosity, although supported by a rigorous and traditional approach. My technique involves a lot of planning to create the final effect I want. The accumulation of many successive thin layers contributes to an ethereal translucent quality that comes in contrast with the solidity and boldness of the ornamental patterns. Like a tightrope walker, I find pleasure in exploring the in-between space where reality meets fantasy. My painting process will often consist of trying to make a figurative scene emerge from the randomness of an abstract background. Alternatively, I will sometimes start by painting a subject realistically and then add arbitrary splashes and drips or imagined patterns. My subjects, even though rooted in realism, often display a splash of the unreal, the unexpected or the whimsical. My direct environment has always been my source of inspiration as I would like my art to make you marvel at our world, and its daily simplicity, humor and beauty.